The Vine Seconds were looking to build on the 20pts they picked up a Tunbridge Wells with their first home game of the season against Bexley. With the Saturday morning rain looking like it stayed away, skipper David Harkin was hopeful another competitive performance could be put in. After losing his second toss of the season, Harkin side were asked to bat by Bexley. Returning Alex Kirk-Patrick from York University and Andy Akerman opened up, but unfortunate Akerman was quickly back in the pavilion after what seemed an unlucky decision. Rayner came and went and it was left to Julius Cowdrey (20*) and Kirk-Patrick (43*) to begin to re-build Vine’s slow start. Both looked in good flow, but at 77/2 after 20 overs the rain began to fall. After 2 hours of solid rain, the decision was made to call the game off and both sides left with 8 points. An unfortunate result as the Vine were confident of posting a good total and with a side including 8 bowlers, were confident they could get on top of Bexley. The seconds face Blackheath away this weekend and hope to pick up some more early season points. 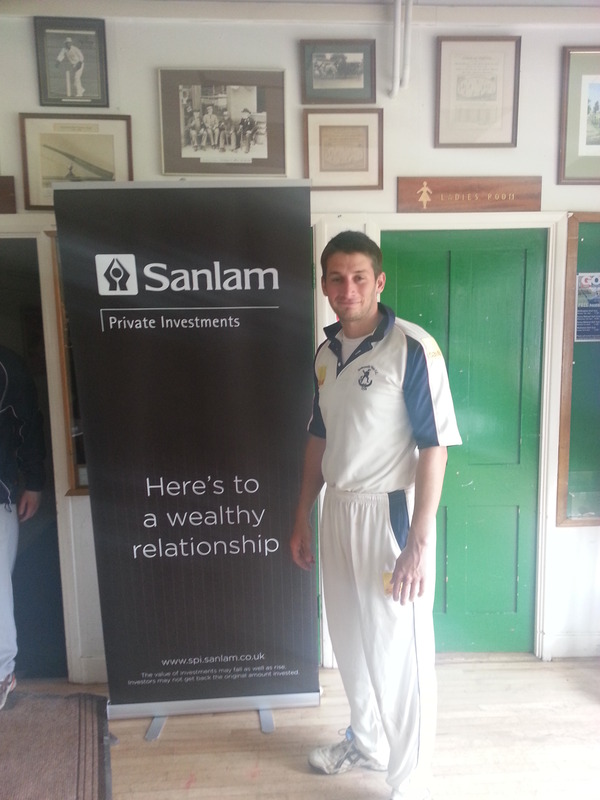 Dave Harkin modelling our new sponsor’s advertising banner in the clubhouse in a rain interval.